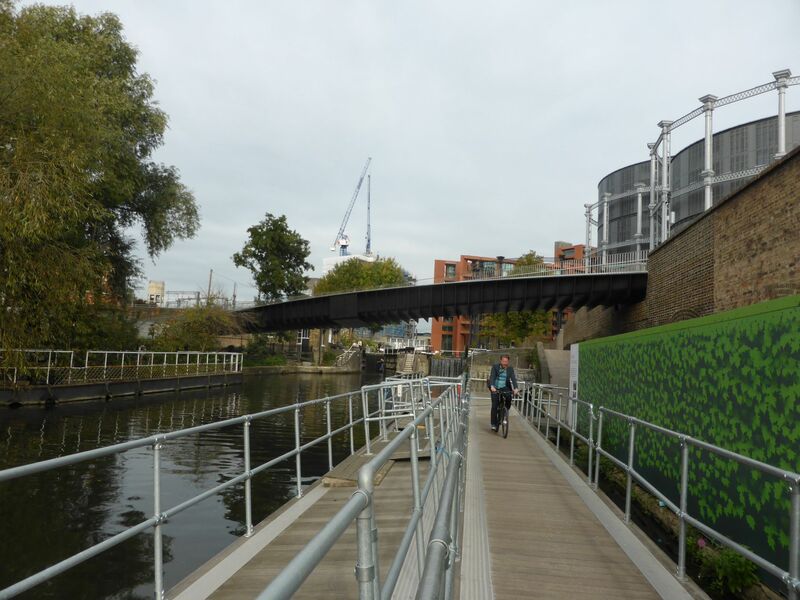 Described in Architects Journal in July 2017 as a ’lightweight love-letter to Victorian Engineering’ the footbridge allows cyclists and pedestrians to cross from Camley Street to the new landmark redevelopment scheme King’s Cross Central. 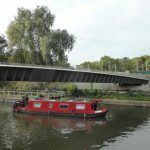 It is hoped that the new bridge will generate more visitors to the Camley Street Natural Park which forms a small oasis of English country side in the city adjacent to the canal. 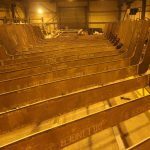 In keeping with the Victorian heritage of the area, the bridge has been kept simple, focusing attention on the precise craftsmanship and high-quality materials. 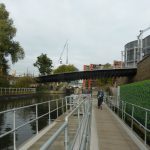 Designed by Moxon Architects with structural engineering by Arup, the details and geometry of the footbridge were developed and modelled by out drawing office creating the 3d model upon which all the fabrication, assembly and installation would be based. 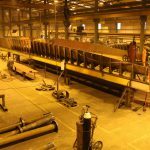 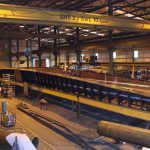 The structure has been fabricated in 15mm thick plate and is a half-through U – frame girder allowing a shallow construction depth. 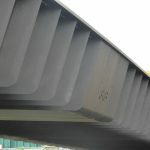 The top chord of the bridge has been made from Duplex stainless steel with the material also being used for the parapet. 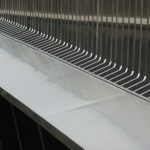 This choice of materials enables the vertical parapet plates to be welded directly to the primary structure which is preferable detail to having each item having a bolted connection. 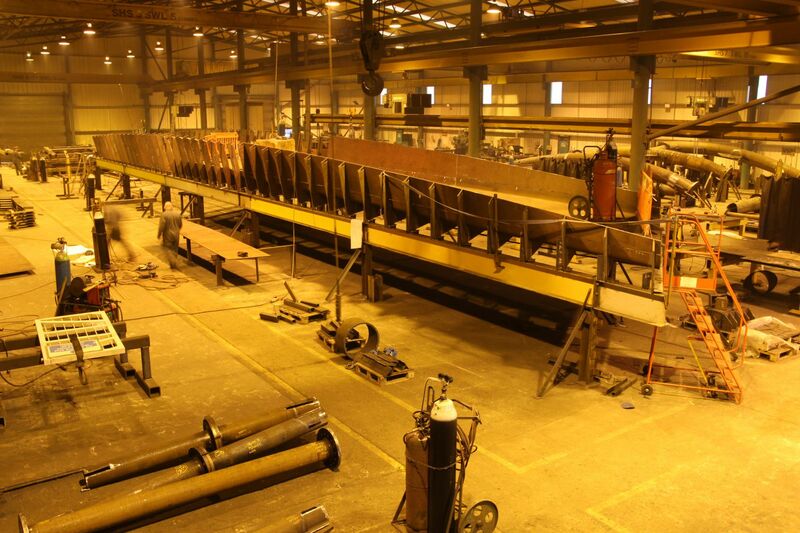 Both the parapet plates and the external stiffeners are at an angle to the bridge centreline. 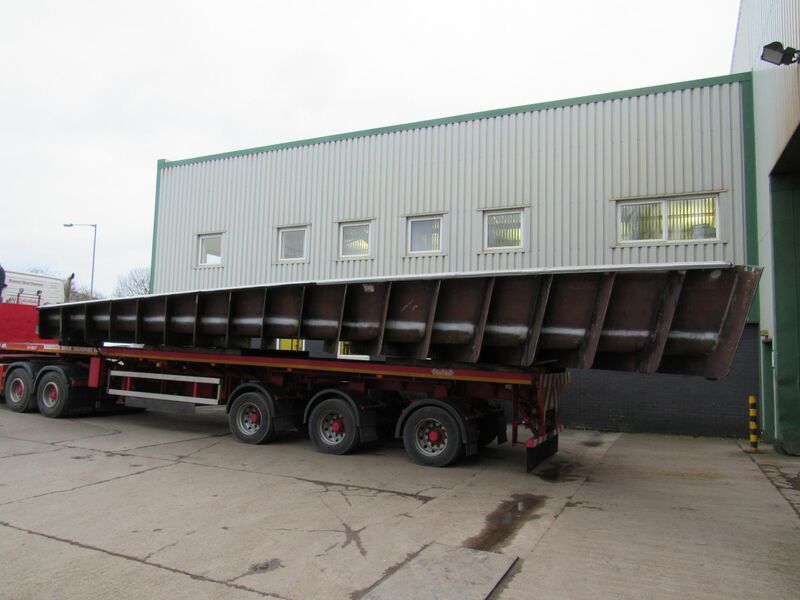 This layout has been selected align these elements with the abutments and the canal itself. 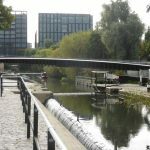 This looks aesthetically correct when the bridge is approached along the towpath and opens-up the views from the bridge itself. 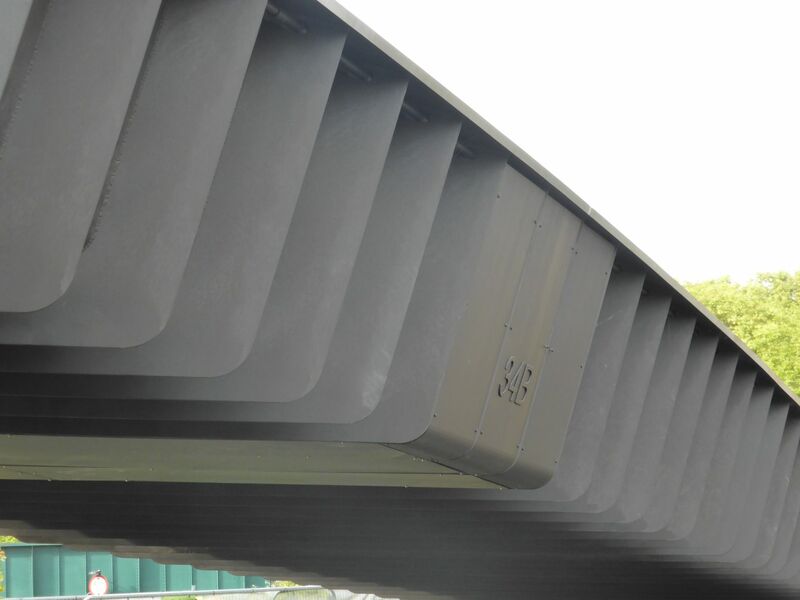 The design of the slender lightweight structure required the installation of tuned mass dampers at midspan to counteract pedestrian generated vibration. 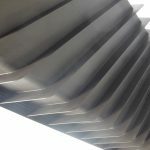 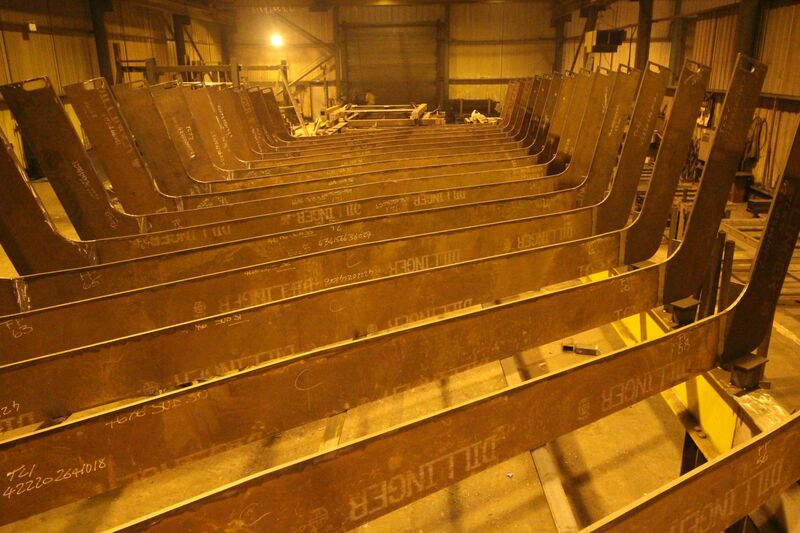 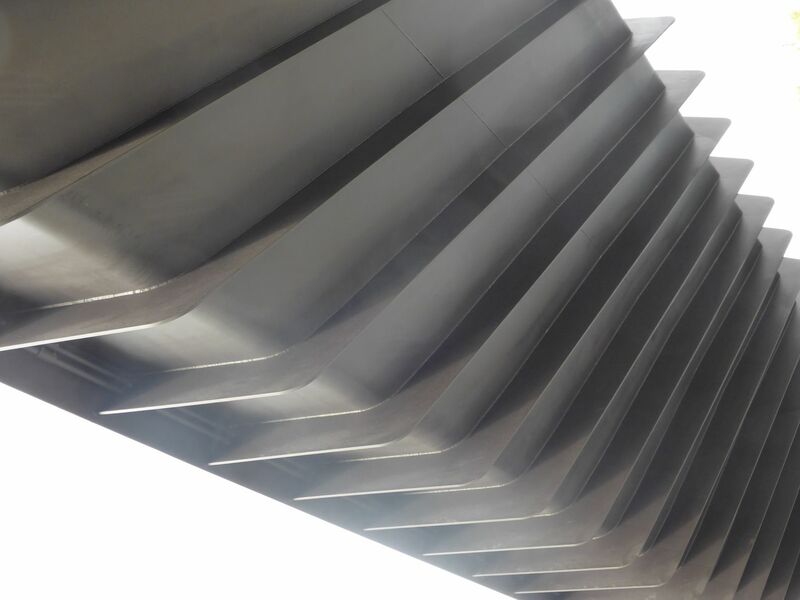 The TMD’s are formed a counter-weight of steel plates suspended on springs and have been installed under the deck between the rib stiffeners and then hidden behind cover plates. 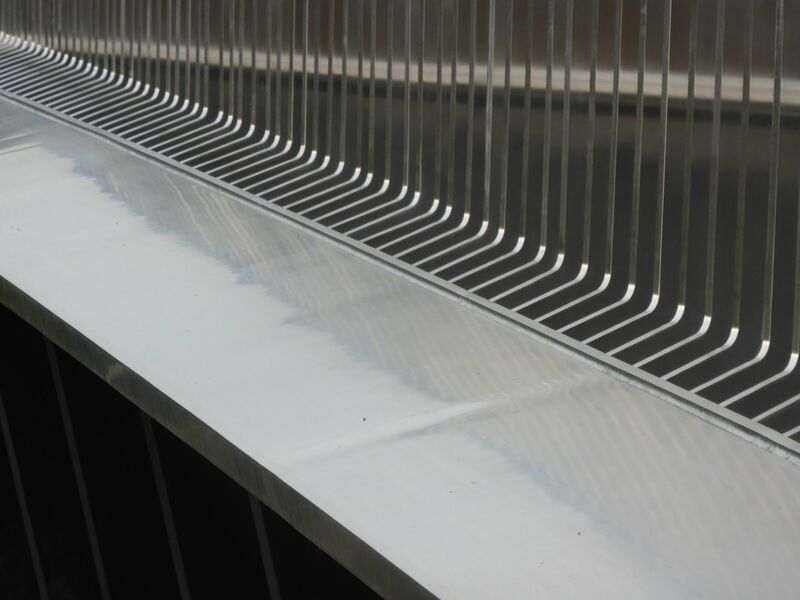 The 3.5m wide walkway has side plates at a 15-degree angle to the vertical giving the simple anti-slip deck a more open feel. 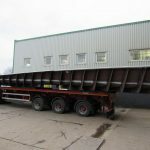 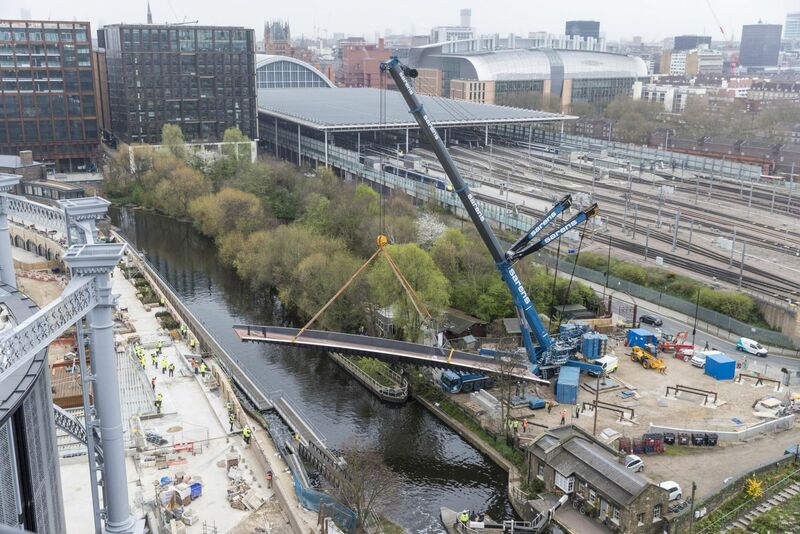 The bridge has an overall span of 38m and weighs 52te and typically for one of our projects the bridge was fully assembled in our works before being broken down into three pieces to be transported to the site at Kings Cross. 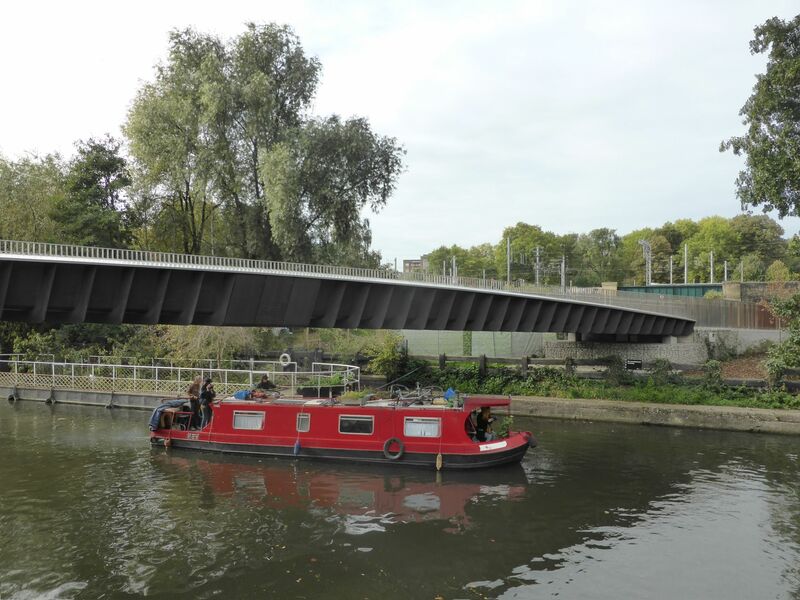 An area of land adjacent to the Regents Canal was made available to allow the bridge to re-assembled on temporary works and fully welded into a single span ready for installation with a 750te capacity mobile crane. 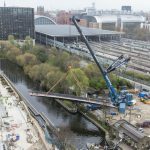 After the acceptance of our detailed safe working method, lift assessment, lift plane and risk assessment the bridge was installed on 29th March 2017 using an LTM 1750 telescopic mobile crane with a jib length of 44m and a working radius for the lift of 28m. 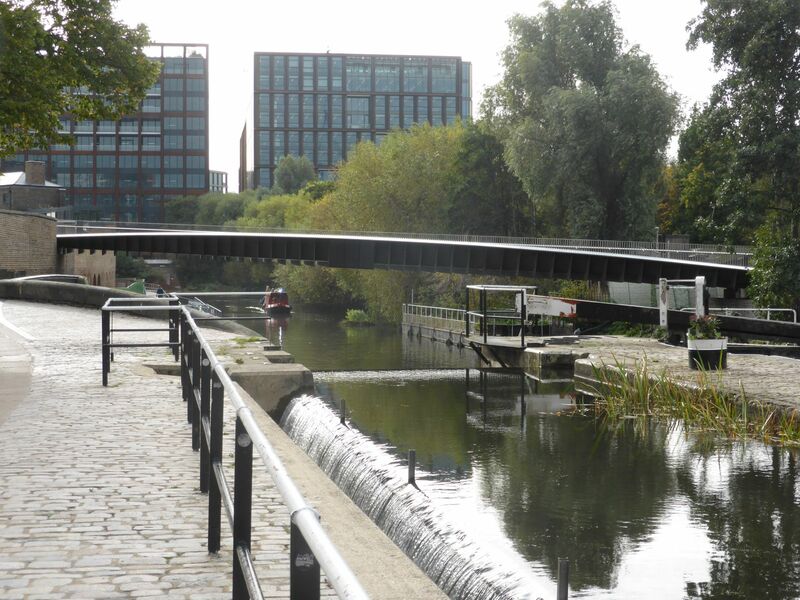 The lift had to be very carefully controlled due to the proximity of the canal itself and the operational Eurostar railway lines in and out of St Pancras Station. 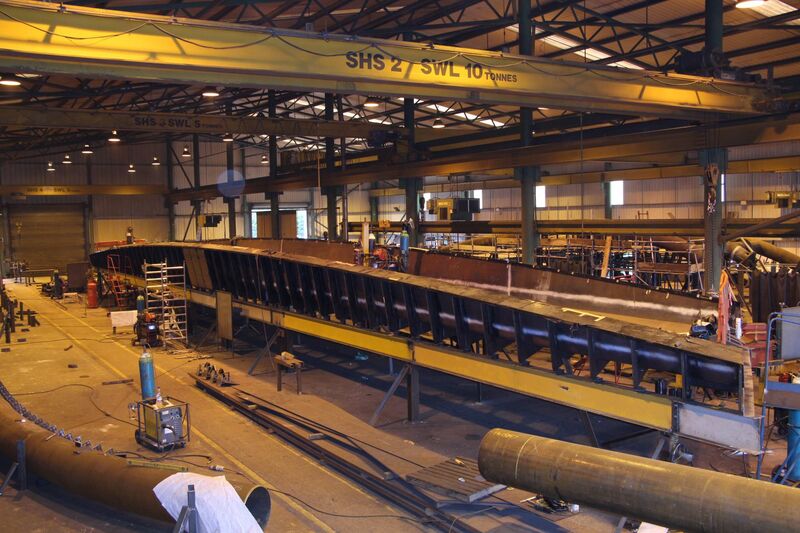 Please follow the YouTube link on our homepage to some time-lapse footage of the installation.